At Christ Restoration Church we are above all concerned with the person and work of the Lord Jesus Christ. The core values listed below demonstrate how this concern affects all that we value. Click on the numbers at the bottom to view each value. 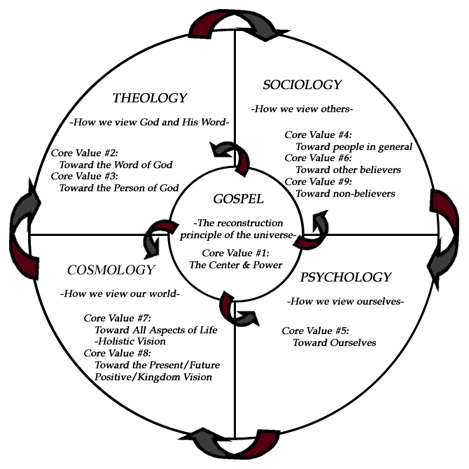 We value the centrality and sufficiency of the gospel. At Christ Restoration Church we believe that Christ changes everything. In other words we value the centrality and sufficiency of the gospel. The gospel is nothing more and nothing less than the person and work of the Lord Jesus Christ, and we desire Him to be preeminent in all that we do. We believe that the gospel is central to the whole of the Christian life, whether it is our justification or sanctification. We believe that it is central to how we do ministry, for we believe that the grace to come to Christ and the grace to grow in Christ are found in it alone. Certainly, we will seek to do all that we do with excellence. However, we refuse to give room to the myth that our church is in the business of making the gospel effective. Rather, we are committed to the exact opposite, the church does not make the gospel effective, but the gospel makes the church effective. The gospel alone is the power of God for salvation to all who believe. We value Christ-centered preaching and teaching. At Christ Restoration Church we believe that Christ mandates our message. In other words, we value Christ-centered preaching and teaching. We are committed to expository teaching and preaching of the whole Word of God as it is properly understood through the person and work of Christ. This involves both teaching historic Christian doctrine as well as admonishing people to obey God as He has revealed Himself in Christ. We believe that a true church is not just where the true word of God is preached but also where the word of God is obeyed. Furthermore, we maintain that the whole Bible is about the gospel. The Bible begins with Christ creating the heavens and the earth (Genesis 1 & John 1), and ends with Christ re-creating the heavens and the earth. The event that ties these two things together is also Christ, His birth, life, death, burial and resurrection. All Scripture is either a revelation of what God requires of His creatures (i.e. Law) or what God has done to meet those requirements in Christ (i.e. Gospel). Therefore, we believe that no passage of Scripture has been truly understood until Christ is seen as the subject matter whether in promise or fulfillment. We value the Glory of God. We preeminently value the unique and holy God. All of history has but one purpose, to glorify God through the redemption of His people (Ephesians 1:6, 12, 13, 3:11; Revelation 4:11, 5:9, 7:9). We are committed to magnifying the praise and glory of God by delighting in His salvation and service while calling others to do the same. We will meet together with God weekly to worship Him, to confess Him, to hear from Him and to fellowship with Him around the table to which He calls us. We recognize this weekly meeting is a foretaste of the glory yet to be revealed (Luke 22:15, 16, 28-30; Revelation 7:9-12 and 19:7-10). We value the primacy of people over programs. At Christ Restoration Churchwe believe that Christ causes us to value and care for people. In other words, we value the primacy of people over programs. In our evangelistic outreach, as well as in our life as a church, we are committed to being more concerned about our “neighbor” and “brother” than the success of our programs. We do not measure success merely by “numbers, nickels and noise” but by people adoring the grace of God and obeying the revealed will of God. In addition, everything that is done in the church will be critiqued by this question: Does this move people toward maturity in Christ or does this merely foster an unhealthy dependence on leaders and programs? We desire that people neither become independent nor dependent. Rather, we desire a community of mature, interdependent disciples. We desire people who can be responsible for themselves and their own family’s spiritual needs while at the same time recognizing the biblical necessity of contributing to the building up of the whole body of Christ. We value internal character over external conformity. Since the root of all sin is in the heart, true repentance is fundamentally a change of heart (Proverbs 4:22; Mark 7:21; Romans 2:28-29). At the core this involves forsaking our trust in false saviors (i.e. the idols of the heart) and turning to the true Savior, the Lord Jesus Christ. In this process the gospel promises conformity to the image of Christ, not conformity to any particular socio-economic group. Therefore, grace demands that we look beyond the external to the internal work of God. In practice this means that we will not judge by petty externals nor burden anyone with rules, standards or laws not found in God’s Word. Rather we will seek to motivate one another with the grace of the gospel. True reformation and revival do not come through “beating the sheep” nor through “moral straight-jacketing”, but through adoring the lovely person and work of Christ against the backdrop of God’s judgment against our sin. We value a servant-hearted community. The gospel creates a new humanity committed to service instead of self (Galatians 5:6, 13). Therefore, we will celebrate our unity in Christ in the midst of our diversity of culture, ethnicity, race and societal position (Galatians 3:28; Colossians 3:11; Revelation 5:9, 7:9). The gospel frees us in such a way that we are able to see ourselves no longer through the misleading lens of human pride and self-sufficiency. Rather, we see ourselves as needy people at the foot of the cross, and there, the ground is level. Thus, in Christ we are free to serve one another in love (Mark 10:42-45; Galatians 5:14). This self-sacrificing, unifying love is the mark of the believing community (John 13:25; 17:21-23). We value the Lordship of Christ over all areas of our lives. Although we recognize a proper distinction between the secular and the sacred, between the domains of common grace and saving grace, we also understand Christ to be Lord of both. He is both Creator and Redeemer. All of life is intended to point us to the person and work of Christ. In this we recognize that all our duties are callings from God whether in the home (parent or child), in the workplace (employer or employee), in the school (teacher or student) or in the society at large (ruler or citizen). Thus, we commit ourselves to obey that same Lord whether in the church or in the world, and to recognize all that we do, whether sacred or secular, to be of equally valid service unto our Creator and Redeemer (Colossians 3:22-4:1; Romans 13:1-8). Likewise, we seek to engage the culture in relevant dialogue, bringing eternity to be upon time. In this we recognize that the gospel does not destroy our humanity but redeems it by restoring us to our original calling to be divine image-bearers tending the garden of God unto the glory of God. Human beings made in the image of the Creator are uniquely creative, intelligent and relational. Therefore, we seek to be neither culturally cold nor culturally accommodating but engagingly relevant, encouraging excellence unto the glory of God. We value the advance and victory of Christ’s Kingdom. We acknowledge and seek to celebrate the fact that the church is something that the Lord Jesus Himself is building by the Spirit-empowered proclamation of His gospel. The gospel is always on the move, powerfully advancing the kingdom of God, plundering the stronghold of the enemy. Recognizing, therefore, that our effectiveness in ministry does not originate in our cleverness, method or hard work but in the One who calls us to this task, we commit ourselves to the foundational task of thinking and praying outside the boundaries of our visible resources (2 Thessalonians 3:1). We ask that God would do immeasurably beyond all we ask or think in blessing our efforts to bring many to faith and establish many other churches (Colossians 1:6; Matthew 16:18; Matthew 28:18-20; Acts 1:8, 2:41-47; Romans 1:16-17; Ephesians 3:20-21). Likewise, we recognize that the Kingdom of God is bigger than any individual church. Therefore, we commit ourselves to networking and cooperating with other churches, groups and individuals who are like-minded in their desire to see the gospel of God’s grace spread and flourish in its mission to bring in worshippers from every tribe, tongue, people and nation (Revelation 5:9, 7:9; Galatians 2:9-10). We value displaying the beauty of the gospel, both individually and corporately. At Christ Restoration Church evangelism is not simply one thing we do, but it permeates everything we do. It is who we are. We treat non-Christians with respect, remembering what it is like not to believe. We treat non-Christians with hope, remembering what a grace-miracle our own faith is. We consider virtually every public event to be something we do “before the nations” (Psalm 67), and we expect to be “overheard” by many friends who do not believe or who don’t know what they believe. We seek not only to equip and motivate every member into an evangelistic life-style but also corporately to display the gospel in the way we live together before the watching world (Matthew 5:14-16).